…. 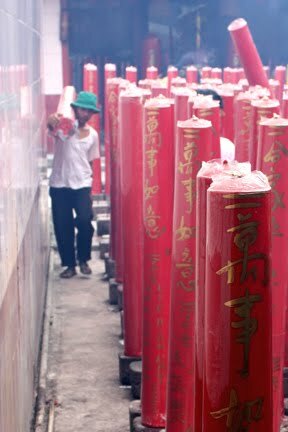 is what you say on Chinese New Year in Jakarta (along with Gong Xi Fat Choi and innumerable variations). Chad and I went up to Glodok, Jakarta’s Chinatown, this year but we missed the boat a little — we went on New Year’s day itself, and a lot of stuff was closed. 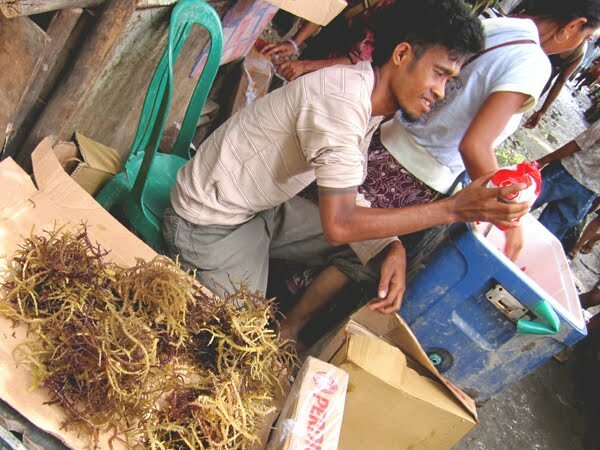 So I’m going to use last year’s pictures, which I never posted due to the Great Kopi Susu Outage of 2009. We went with our friends Howie and Haviva, who have since tragically moved back to the US (we miss you, Havowie!). It must have been just 2 or 3 days before the holiday because the place was hopping. 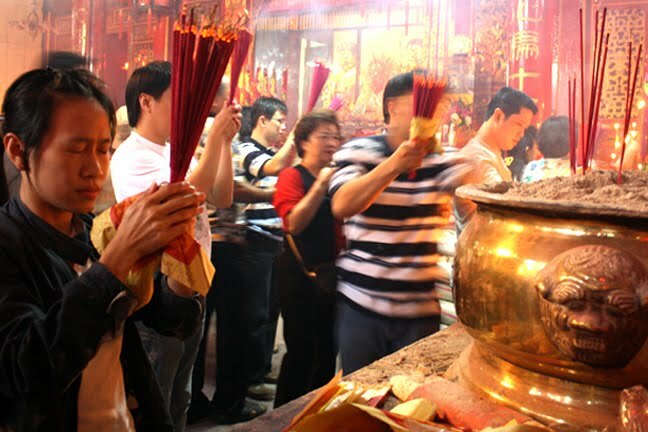 Inside the main temple, people were lighting big bunches of incense, doing a short prayer ritual, and leaving the incense sticks burning at the altars. Temple employees were buzzing around removing the sticks almost as fast as people put them down, but they were still pressed to clear enough room for the oncoming waves of worshipers. The air was so thick with spicy smoke, everyone was red-eyed and coughing. Out back there were candles as tall as your head, which you could buy and leave burning in the temple courtyard for days. It’s traditional to give money away for the holiday, so poor people had packed the temple’s whole front yard. 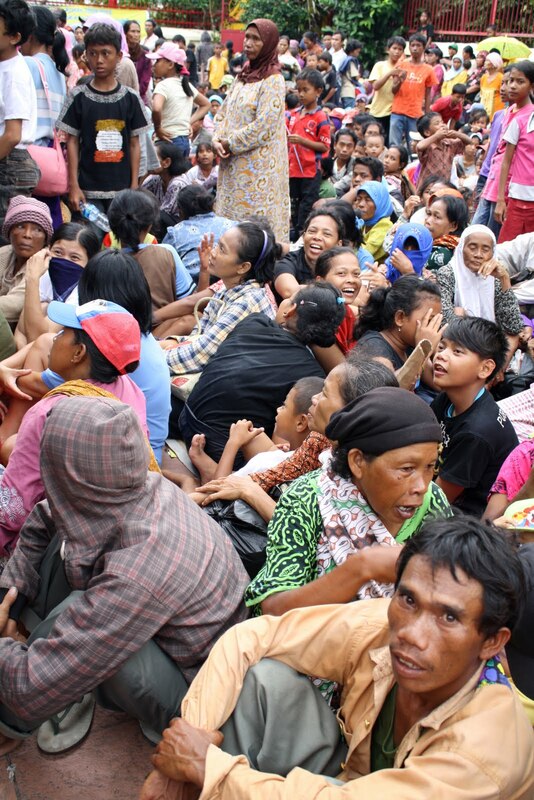 Some of them ride trains for hours all the way from Central Java to get in on the charity. Train tickets and food are relatively cheap, while rich businesspeople sometimes give away substantial sums of cash, so the math makes sense. I hate crowd scenes like these, and fatal stampedes are not out of the question, so we didn’t linger long here. Of course, New Year’s isn’t just about going to the temple, any more than Christmas is only about church. The streets were packed with cool holiday stuff, including complete outfits for kids. 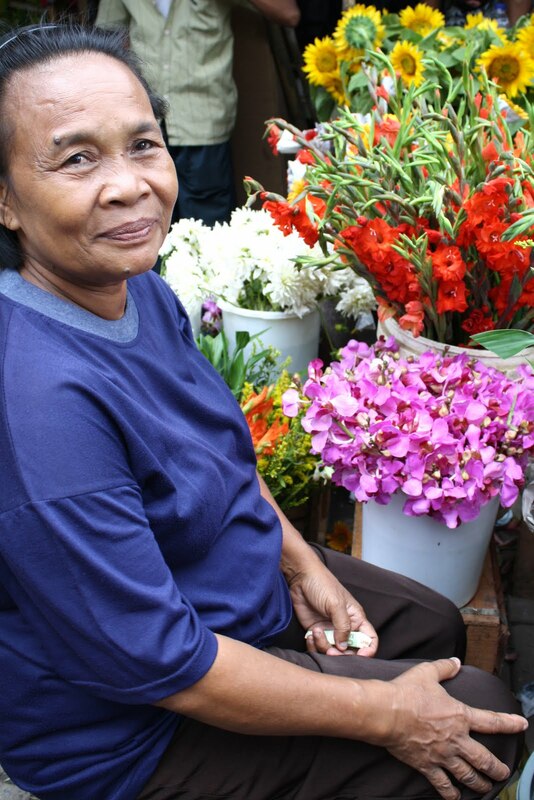 Flower-sellers were out getting their share of the holiday spending …. and all sorts of holiday treats were on sale, including golden coins (chocolate, I assume) and the impenetrable kue keranjang. 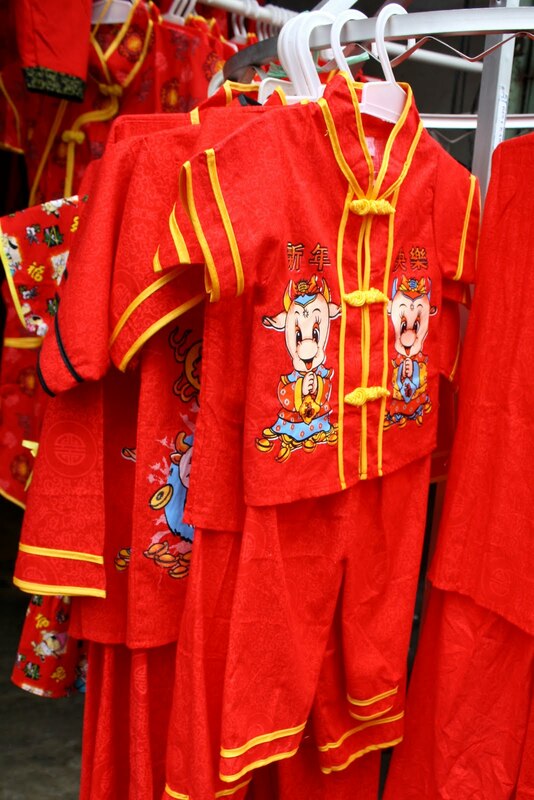 Chinese New Year is so widely celebrated here, not only in Glodok but in malls, advertisements and public events throughout the country, it’s hard to grasp that it was all illegal just a decade ago. Under Suharto, Indonesians of Chinese descent couldn’t publicly celebrate their holidays or use the Chinese language. They were required to carry special i.d. and were systematically eliminated from the higher levels of government and military. Today, the discriminatory laws have largely been revoked (although there are reports of crooked officials still applying the old citizenship restrictions or extorting people for extra money to get around them). Jakarta is certainly more joyful, colorful and delicious as a result. 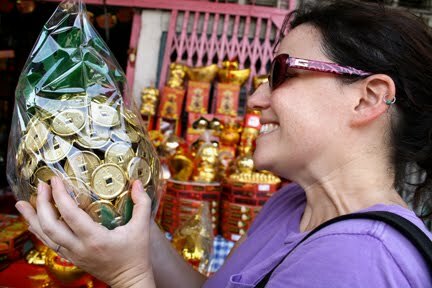 Author Trish AndertonPosted on February 28, 2010 May 17, 2014 Categories Uncategorized73 Comments on Gong Xi Fa Chai! As far as I know there are only two places to get food from Papua in Jakarta, which is a shame, because it’s delicious and quite distinctive. It’s also fun to play with, as you will see. One of the two outlets is in Blok M, which is relatively nearby, so I go now and then to get my fix. 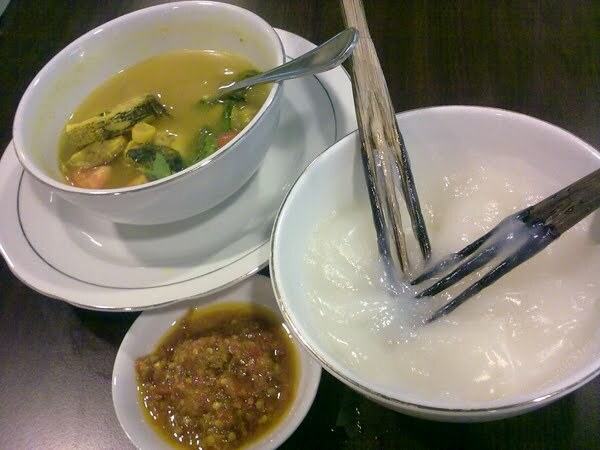 The signature dish at this place is a fish stew served with papeda, or sago palm porridge. The stew is spicy-tangy with lots of fresh herbs. It has strong citrusy flavors suggestive of lime leaf and lemongrass. There’s a brightness and complexity (and hotness!) to the taste that reminds me of Thai food. But the best part is the papeda, which is served with a pair of three-pronged wooden forks. It’s more like a gel than a porridge, with a thick, gluey texture. It’s very bland and has just a hint of rooty flavor like potato or yam. It’s also very filling, turning a bowl of soup into a hearty meal. To transport the papeda from the serving dish to your bowl, you pull a hunk of it up on the forks and then keep twirling the forks, one over the other, so the goo doesn’t fall off. When you reach your bowl, you use each fork to scrape the papeda off the other. 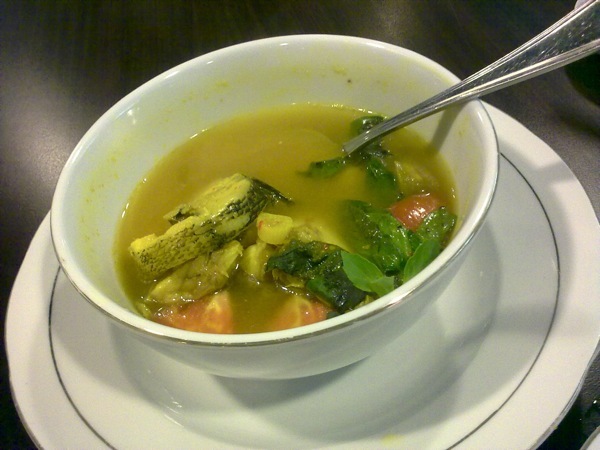 Of course, they could just bring you an individual serving of soup with the papeda already in it. But what would be the fun in that? 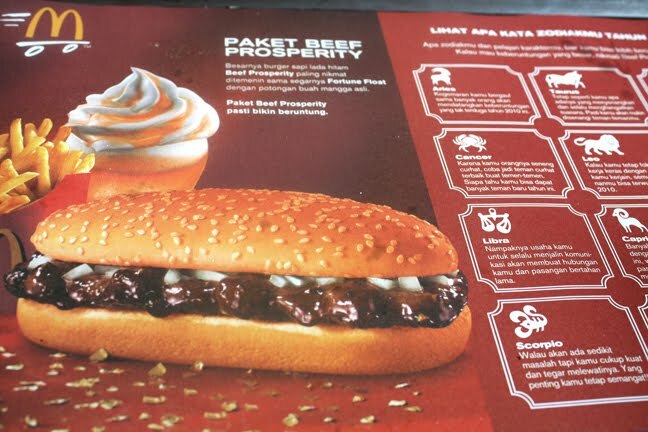 Every year around Chinese New Year’s, McDonald’s puts out a special Beef Prosperity burger in Indonesia, Malaysia and Singapore. I told my friend Pinta I thought the picture on the billboards looked nasty, but she said Beef Prosperity was in fact delicious, so I figured I’d give it a try. 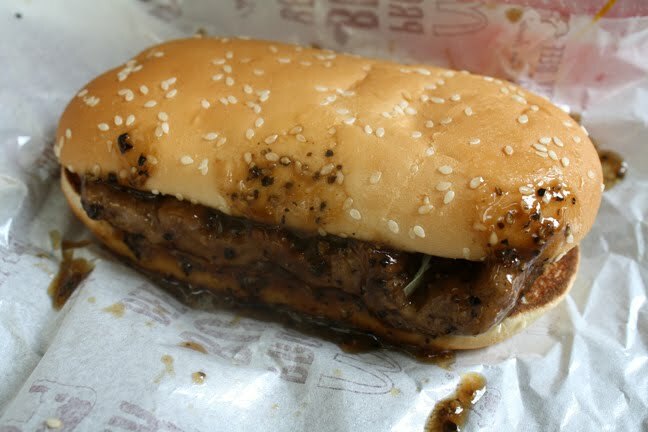 Beef Prosperity is a sort of elongated burger on a special bun. 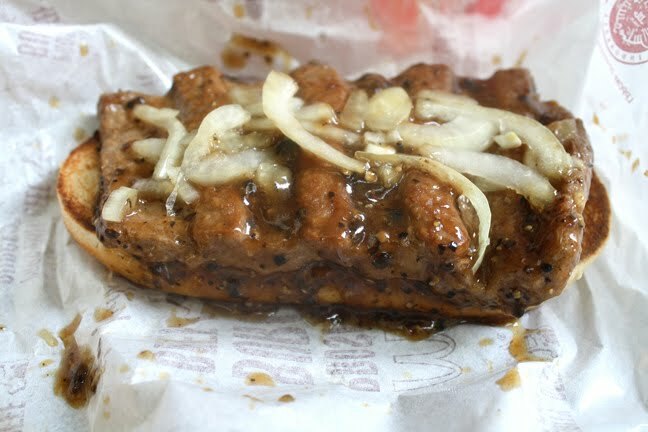 McDonald’s cleverly douses the burger in black pepper sauce to hide the inferior quality of their meat. The sauce is actually pretty tasty. For some reason the burger is kind of wavy-shaped instead of flat. It comes with raw onions on it, which are not my favorite, but at least they’re mild ones. In case this is not enough calories for you, the Beef Prosperity is offered in a set with fries and a Mango Float. This consists of Sprite (I think) with a whipped topping that was heavier than Cool Whip but lighter than soft-serve ice cream. It was creamy and didn’t melt and I really don’t know what it was. 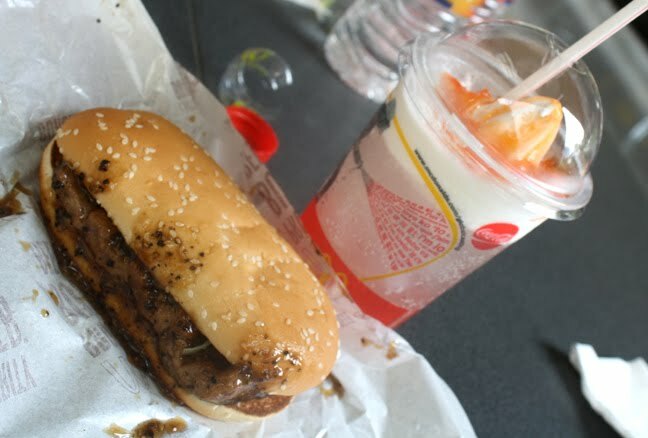 Both it and the burger were enjoyable in that so-bad-it’s-good way that characterizes most fast food. The strange thing is, even though Beef Prosperity is clearly a Chinese New Year’s item (in Malaysia they even include some kind of ang pao, the traditional little red envelopes given out at that time of year), the placemat that came with it showed a Greek zodiac. Huh? Perhaps this astrological confusion accounted for Beef Prosperity’s decidedly un-prosperous effect on us. Chad and I both had some pretty serious digestive upsets after eating these. OK, maybe that had more to do with the food than the placemat, but here’s the kicker: that same afternoon, I had my cellphone swiped from my bag at a nearby department store! Prosperity FAIL, as the cool kids say. This time it wasn’t us. 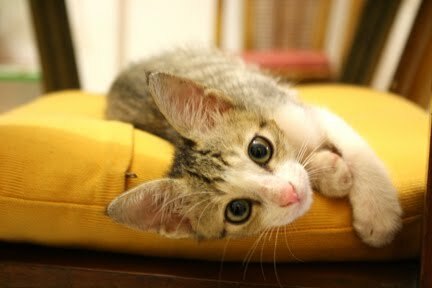 It was our housemates who fell victim to the adorable, scraggly kitten who kept meowing at the door one rainy weekend. Rugrat wouldn’t take no for an answer, and before long he was settled right in on the rug. He was a pretty scruffy little guy! Two baths, one trip to the vet, and what seemed like several pounds of kitten food later, however, he’s looking much more presentable. 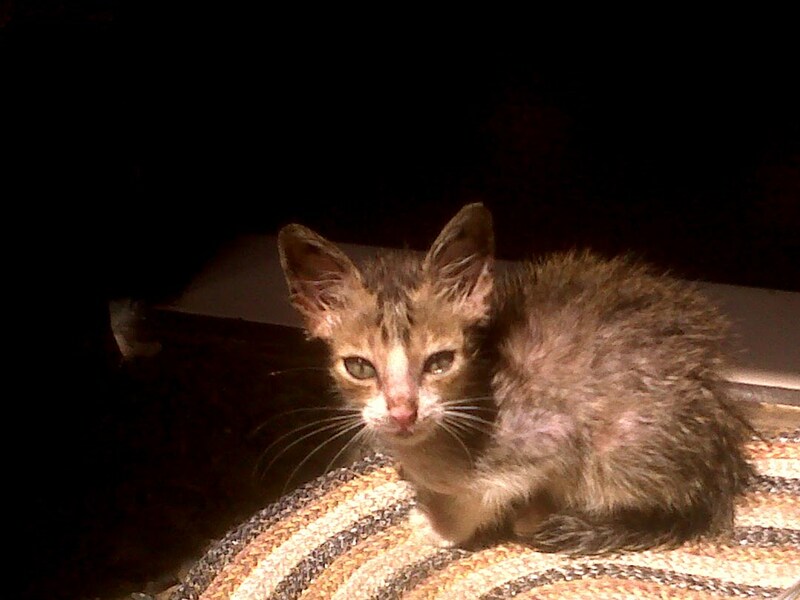 He and Susu have become great friends, which means they spend all day chasing each other and wrestling. 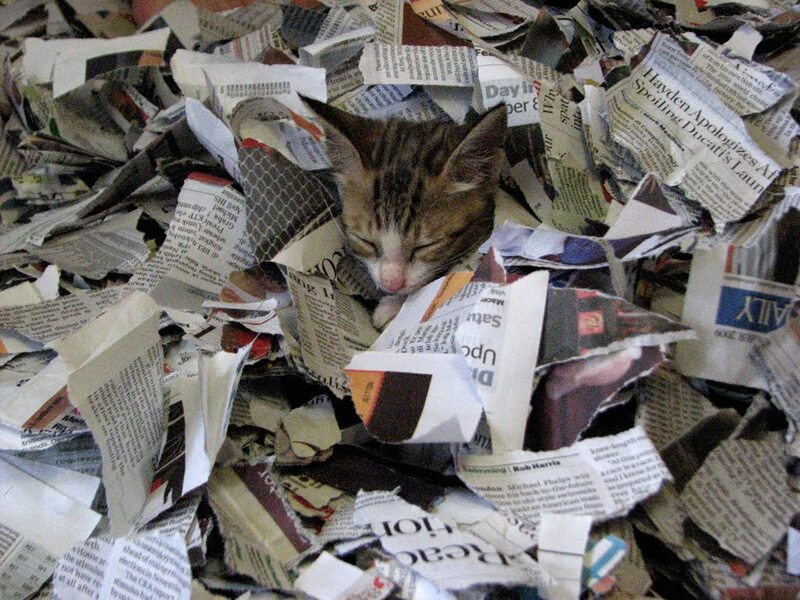 He even pitched in when we shredded newspapers for the compost the other day. 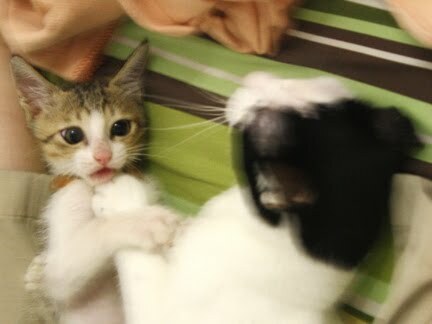 Author Trish AndertonPosted on February 17, 2010 May 18, 2014 Categories cats2 Comments on Warning: Cute kitten photos! 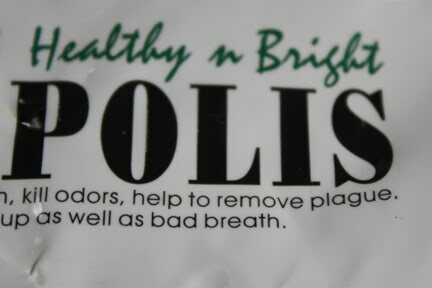 I originally bought this toothpaste in Manila because it promised to help remove plague. What with all the H1N1, H5N1 and fan death going around these days, you can’t be too careful. 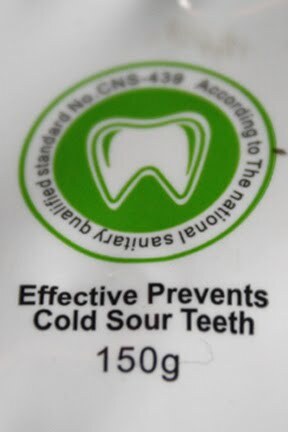 Only later did I realize this toothpaste also prevents “cold sour teeth”. This is a bit of a puzzle because in my experience, teeth live in your mouth, which is, you know, warm. They might get cold when you eat ice cream, but then where does the sourness come from? But the real problem is, propolis itself tastes lousy. The reason for this became clearer when I realized it’s a resinous mixture that honey bees collect from tree buds, sap flows, or other botanical sources and use to plug holes in their hives. Yum, bee cement. 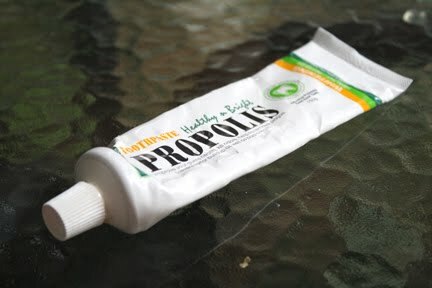 I’m not sure propolis breath is any better than garlic breath. For that matter, I’m not sure it’s better than having the plague. Luckily, the tube is almost empty now and we don’t plan on resupplying during our lifetime. 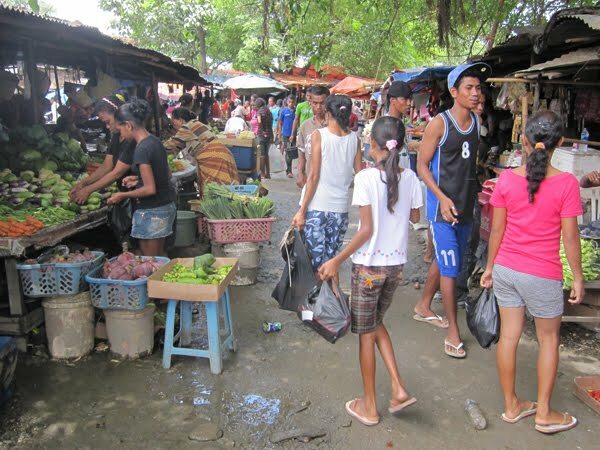 Dili’s traditional market is sort of like a small-town Indonesian market: a long wander down an alley lined with ramshackle stalls. Evil smells mingling with wonderful ones. Slimy stuff of uncertain origin underfoot. 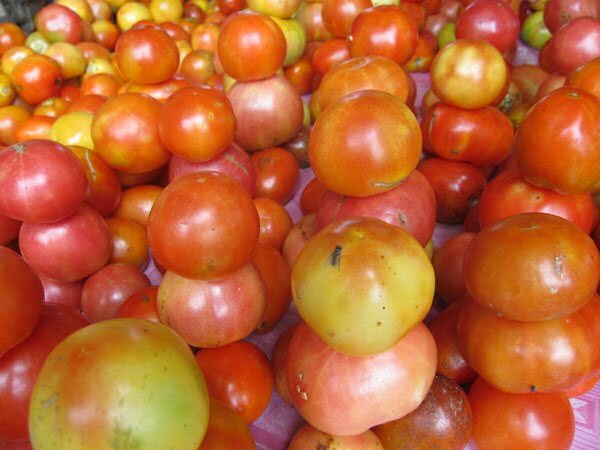 But while Indonesians usually arrange the produce in large pyramids, in Dili they create single-portion sculptures, like these little towers of tomatoes. These are stacks of seaweed. Behind them, the guy is holding a frozen chicken from Russia — another thing you don’t usually find in Indonesian markets. 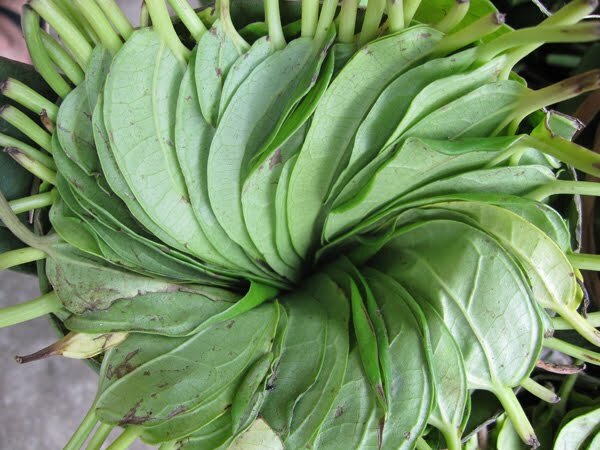 Here are some nicely arranged betel leaves, sold for chewing along with betel nuts. 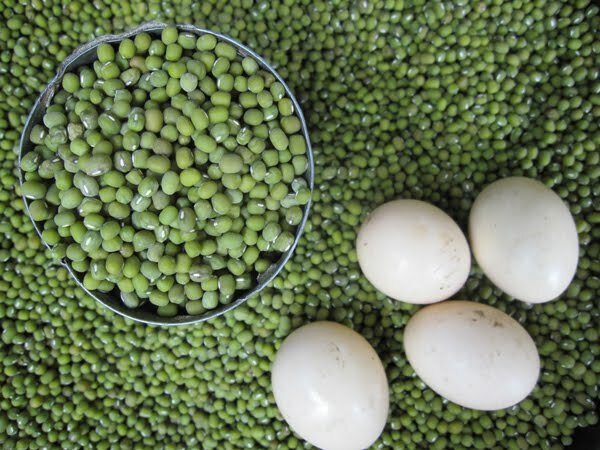 Mung beans and eggs — I’m not sure what the connection is, but I like how they look together. The tofu-seller wanted me to take a picture of his daughter (or wife? ).